Partial dentures are constructed from acrylic with a metal framework. Sometimes they can be made completely out of acrylic. They are designed to fit securely around a patient’s remaining teeth and are useful when there are multiple missing teeth. Dr. Mead designs partial dentures very carefully so that the chewing forces are evenly distributed over the entire surface are of the remaining teeth and soft tissues. Metal partials are generally preferred as they are structurally superior. They are thinner and more hygienic than an acrylic partial. Acrylic partials are typically used as a transitional or temporary partial. 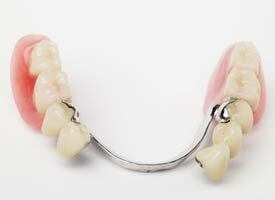 Is a partial denture right for me? A removable partial denture can allow you to better grind and chew food improving digestion. They can also help limit movement of your existing natural teeth by holding the empty spaces. Since partial dentures do not create a seal to the gum tissues like complete dentures do, food can easily slip underneath a partial denture when you eat. Partial dentures must be removed and cleaned each time you eat to avoid food entrapment, gum irritation and decay.